World-renowned Chef Robert Irvine and FortiFX™ founder/ industry pioneer Sean Perich teamed up to create a protein bar that provided real great-taste and nutrition. 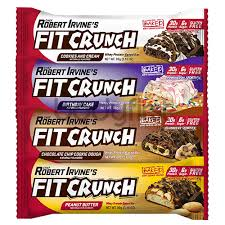 These two industry leaders pushed one another to create a product worthy of their reputations and beyond your expectations: FIT CRUNCH™ Baked Bars were born, the only 6-layer baked bars on the planet. Inspired by an American favorite, this protein bar captures the essence of a midnight snack that can be enjoyed 24-7, delivering a high protein, low sugar meal replacement. A rich, chocolate cookie core, is layered with fluffy vanilla cream, crunchy chocolate graham bits, high protein white chocolate and chocolate crisps. Lastly, we top each bar with a high protein chocolate and white chocolate drizzle. This is one rich, exciting low calorie treat. This kind of inspired nutrition can only come from the team of Chef Robert Irvine and FortiFX. Delicious nutrition that will give you the mental and physical edge to optimize your workout. Buy now, so you can enjoy later!